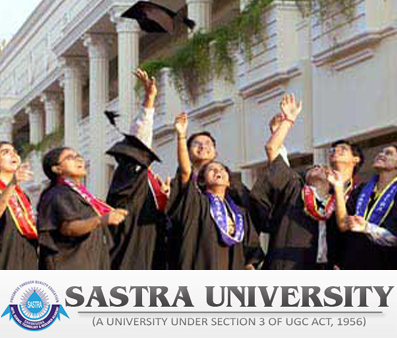 SASTRA University Admission to all programmes is strictly based on merit only. SASTRA University offers the following full time courses: B. Tech., 5- Year integrated M.Tech., M. Tech., MCA, MBA, B.Com (CA), B.A./B.Com./B.B.A., LL.B, (Hons.) 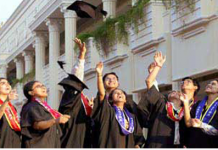 & B.Sc / B.A, B.Ed (4 year integrated) programmes in its main campus in Thanjavur and B.Sc., B.Com, BBA, BCA, M.Sc., M. Phil and B. Tech. (CSE, ECE, EEE, IT) courses in its Srinivasa Ramanujan Centre (off-campus centre of SASTRA recognized by Govt. of India) in Kumbakonam. There are 9 hostels for boys and 5 girls hostel. Application Form for admission in SASTRA University has been released at the official website. Candidates can check complete details on SASTRA University Admission 2019 from here. Seat can not be reserved before for admission under merit list. Only NRI sponsored students can approach the office of Admission for more admission information. For Engineering, admission will be based on JEE Main score and class 12th marks. For all PG programmes the admission will be made on the basis of the scores in the qualifying UG / PG degree programme. For all degree programmes in Law, admission will be based on CLAT 2019 scores and class 12th aggregate taken in the ratio of 25%:75% respectively. For all other degree programmes in Science, Arts, Commerce, Education, etc admission will be based on the qualifying exam marks. Admission to the B.Tech. / 5-year Integrated M.Tech. programs will be conducted under two streams. All the applicants will be eligible for both the stream and need not submit two separate application form. This application form will be considered for the both streams. These programs will be made on the basis of the scores in the qualifying UG / PG degree programme. GATE qualified candidates will be given preference for Engineering programmes and for MBA, students with good CAT/XAT/AIMAT/CMAT scores will be given preference. The law admissions will be based on the CLAT 2019 Scores and +2 aggregate taken in the ratio of 25% & 75% respectively. All other programs like in Sciences, Arts, Commerce, Education, etc. admissions will be based on the qualifying exam marks. Application forms will be available in online as well as offline mode. Candidates can download it of fill online application by visiting the official website. Candidates must ensure their eligibility before filling the application form. Online or Offline forms must be submitted on or before its last date. Applicants are advised to submit application along with a photocopy of their +2 mark sheet. It can also be collected in person from the Office of Admissions at SASTRA Deemed University campus in Thanjavur or Kumbakonam. Applications fee is Rs.600/- Application forms can also be downloaded at www.sastra.edu. Applications can also be sent by post on receipt of DD for Rs.650/- favouring SASTRA payable at Thanjavur. DD must be sent to Office of Admissions, SASTRA Deemed University, Thanjavur – 613 401, Tamil Nadu. Rank list for SASTRA University Admission 2019 will be release on the official website, Candidates can check the same from the official website i.e., www.sastra.edu. or through the direct link which is provided below. Development fees (one-time payment) Rs. * Monthly Stipend of Rs. 5000/- will be provided to eligilble GATE qualified candidates. For B.Com. (CA)/B.Com. (BFSI) / B.Sc. B.Ed. / B.A. B.Ed. / B.Sc. / B.B.A. / B.C.A. / B.Com. / M.Com. / M.Sc.